Our pop up at Le Bon Marché in December 2018 with our laser engraving machine to let the imagination of our customers be free and engrave a little word, a sketch, or choose a style from our illustrations. Messages may even be hidden under the lateral handle for more discretion. 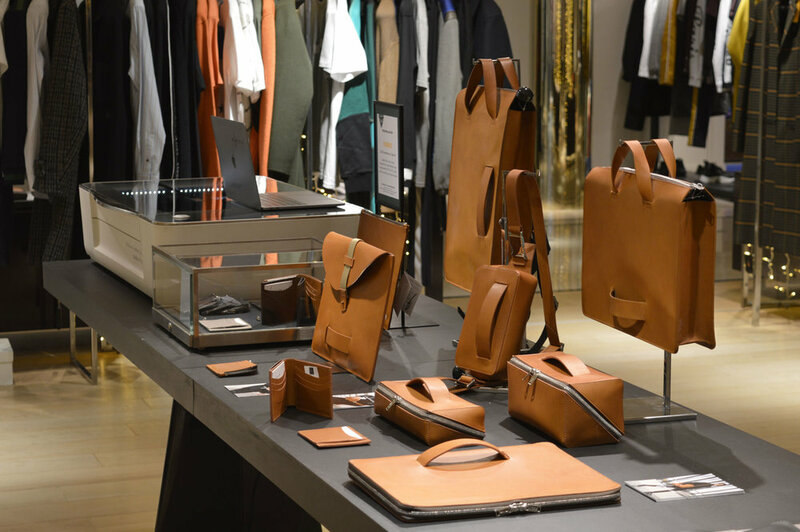 After 3 year of a strong partnership with Le Bon Marché in Paris, we have developed an exclusive colorway in our vegetal tanned leather, Concrete grey. 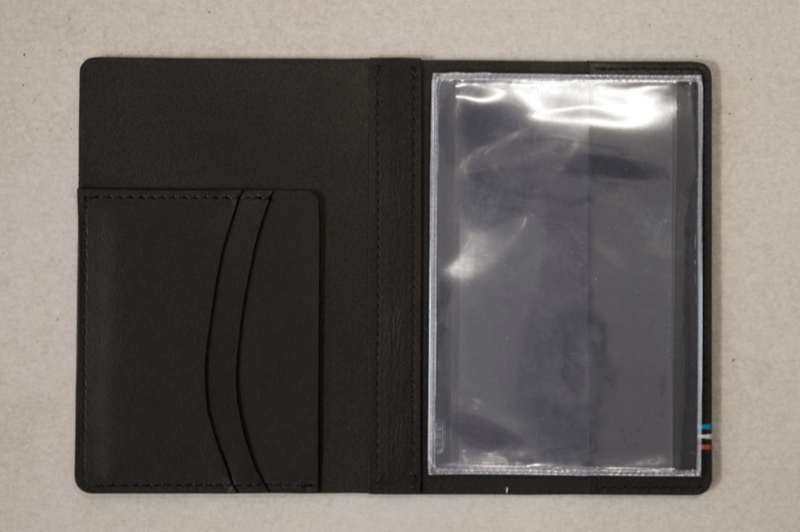 We have developed with ALPINE Valence a card holder for the identity papers of the vehicle. All products are laser personalized with initials and the limited number of each car sold. Thanks to all for being at the opening of our first shop Le Feuillet in Lyon. Thanks to our friends and family, and to all the people who follow us for three years. 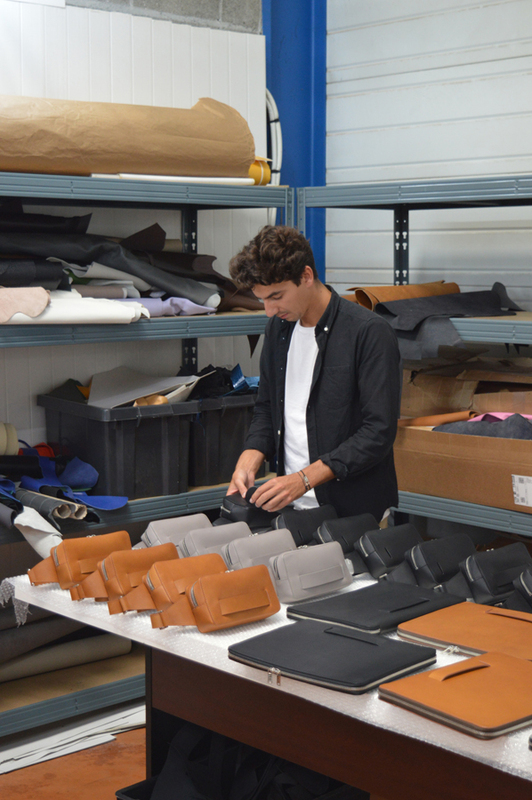 All our leather are produced in France. 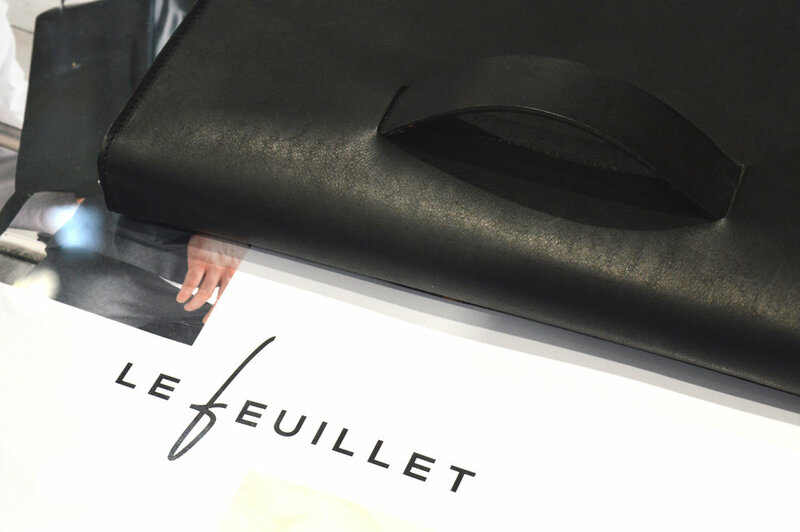 Le Feuillet chose the excellent french savoir-faire for the manufacture of its products, that's why the production of all our leather is in France. 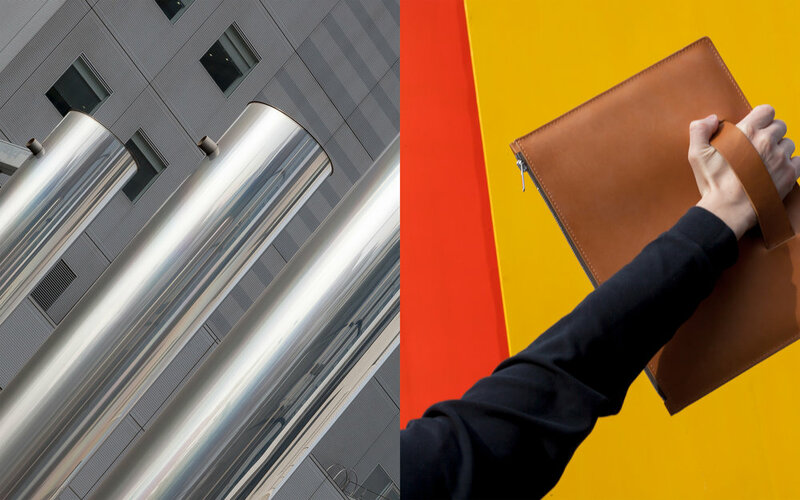 We are part of the program called Au-Delà Du Cuir which follows leather brands that promotes the french savoir-faire around the world. this program is partly funded by the French Federation of Tanners that produce this beautiful reportage. 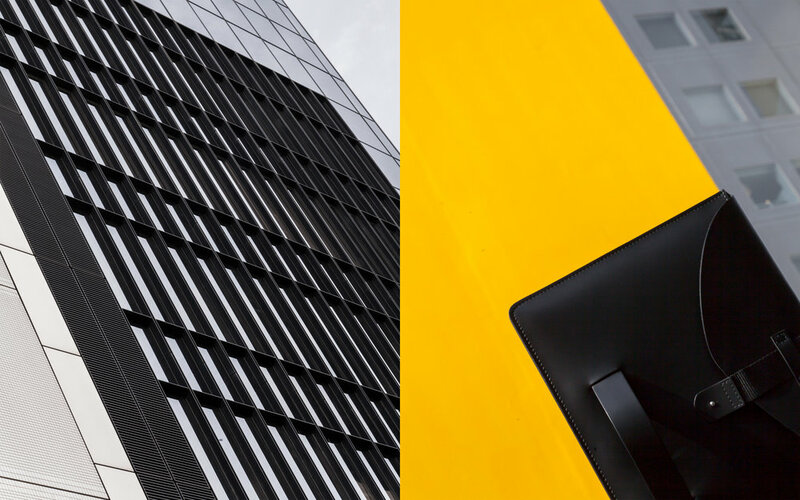 A few months ago we moved our head quarter to the heart of Lyon in order to open a hybrid place with two floors. 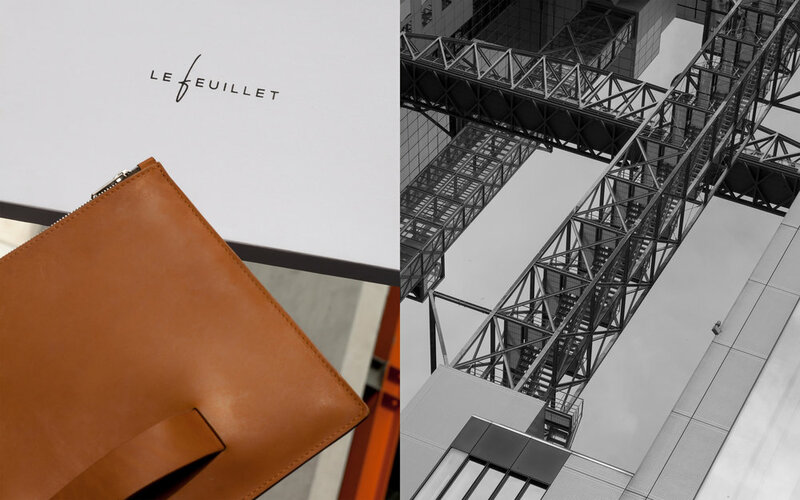 Our office is on the first floor and our own Le Feuillet first shop will open soon on the ground floor. We are proud to share with you this amazing project that will open in about one month. 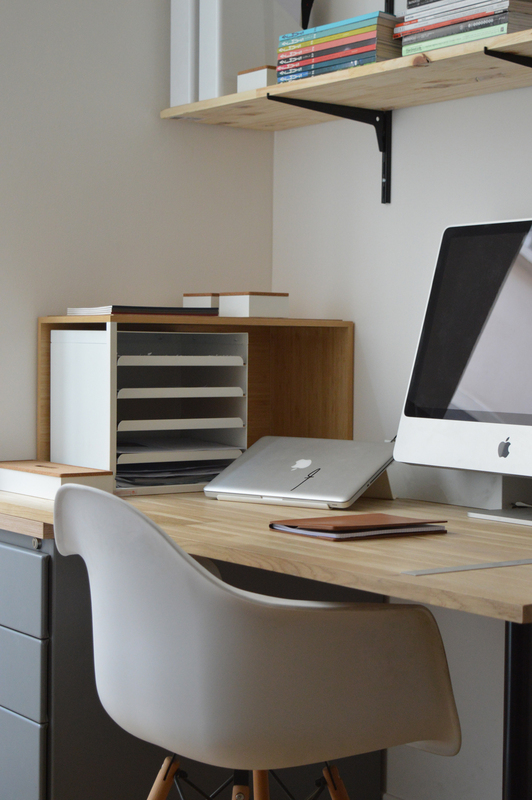 Here are some of secret pictures of our new office. 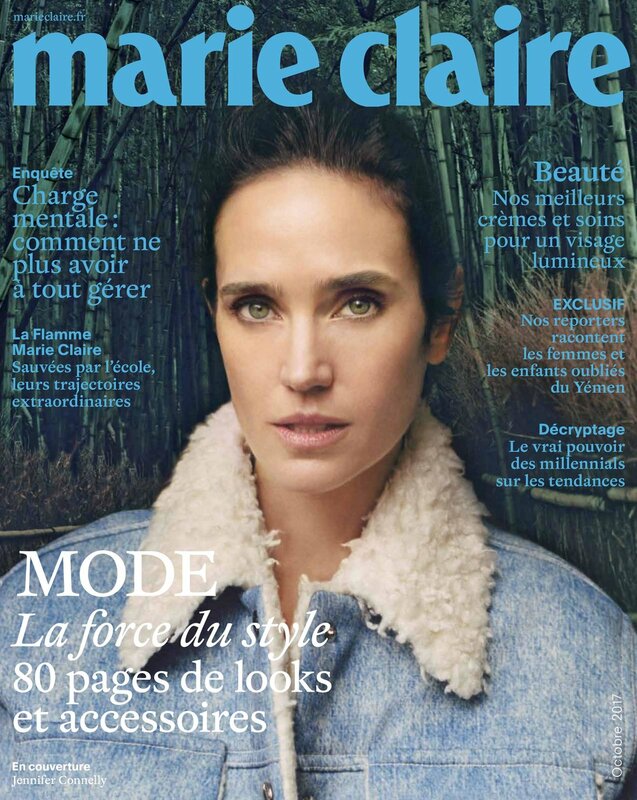 Le Feuillet released in the new Marie Claire France with all the OpenMyMed Prize 2017 laureates in a beautiful editorial. A huge thanks to la MAISON MÉDITERRANÉENNE DES MÉTIERS DE LA MODE à MARSEILLE. Few month ago we went to New York to shot our SS17 campaign at the Spring Street Salt Shed built by Dattner Architects and WXY Architecture. The building form was inspired by the strong geometry of a salt crystal. Rising nearly 70 feet along the Hudson River at the intersection of West Street and Canal Street, this highly visible structure will house 5,000 tons of salt. The Salt Shed’s crystalline, faceted planes enliven the reinforced concrete enclosure. Its strong sculptural form and honest materials accept the urban fabric recalling reference to Le Feuillet approach to highlight modern and clean design interacting with the environment of its carrier. The designer of Le Feuillet Ylan Dahan took the artistic direction of this lookbook to create this scenography and express his vision of the design, the interaction between the body and the object, between architecture and its environment. The play of angles, lights and volumes animates Le Feuillet, reflecting the habitat of its inspiration. During our AW17 shooting campaign at La Défense - Paris our friend Olivier Arnod shot Yann Ndoumbé & the Dahan Brothers using his argentic camera. 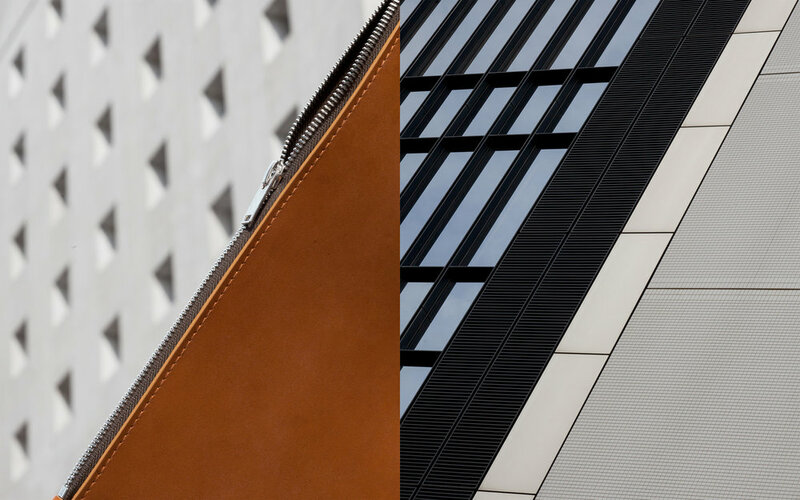 Using Hiroshi Hara’s architectural design as a catalyst, this series pairs Le Feuillet leather goods with Hara’s iconic Umeda Sky Building. The high-rise building consists of two towers bridged by a rooftop observatory. 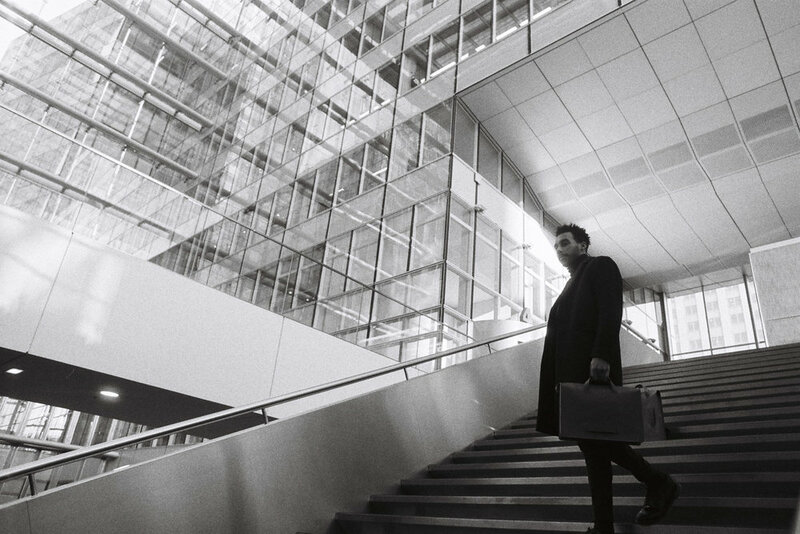 The series is particularly inspired by the utilitarian circular atrium at the center of the observatory, which is used not only to enforce the building’s tolerance against earthquakes and oscillation but also to harmonize the building’s aesthetic composition. 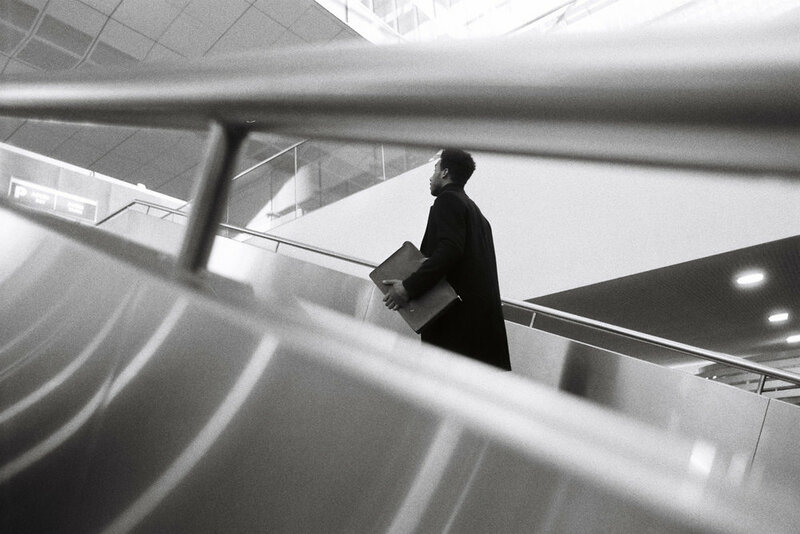 Hara is known for his integration of sleek and clean lines with polished technical prowess. 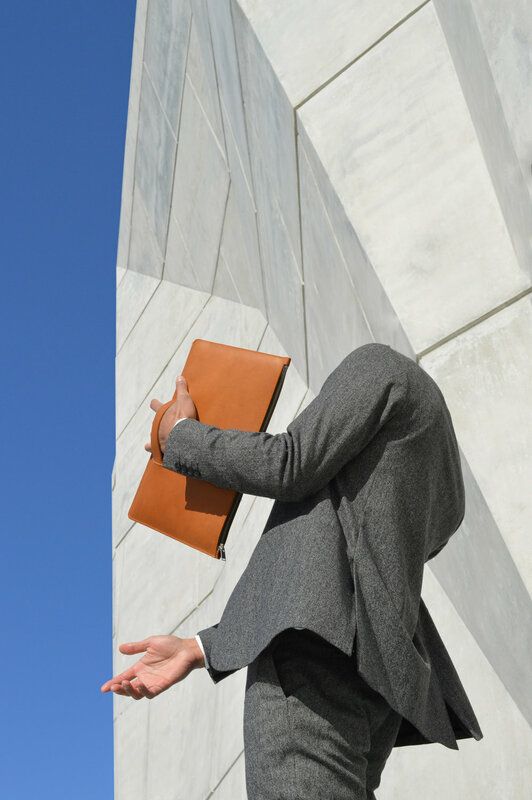 Calling reference to Hara’s approach, Le Feuillet combines immaculate minimalist design and French high-quality craftsmanship to create a collection of premium leather goods. 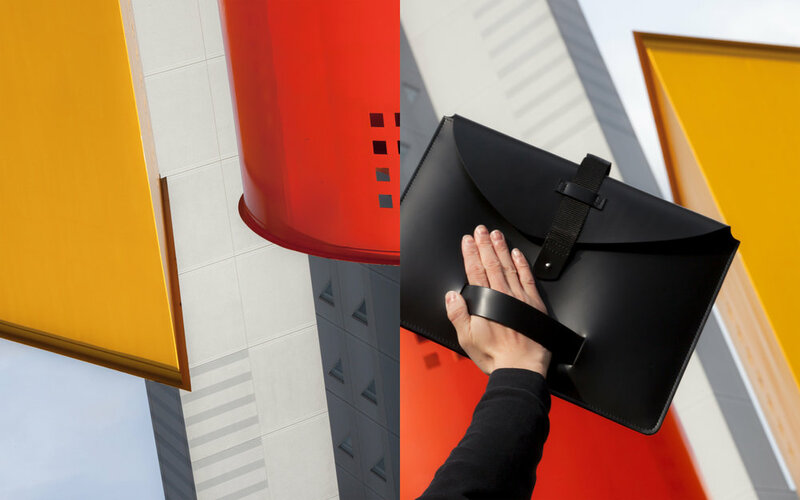 Le Feuillet is laureate of the 7th edition of the OPENMYMED PRIZE 2017 competition created by the Maison Méditerranéenne des Métiers de la Mode (MMMM). Thank you to the jury of professionals from the Fashion World, including guest of honour Simon Porte JACQUEMUS. We made exclusive and limited product in collaboration with one of our best retailer X By Bluerider in Taïwan. 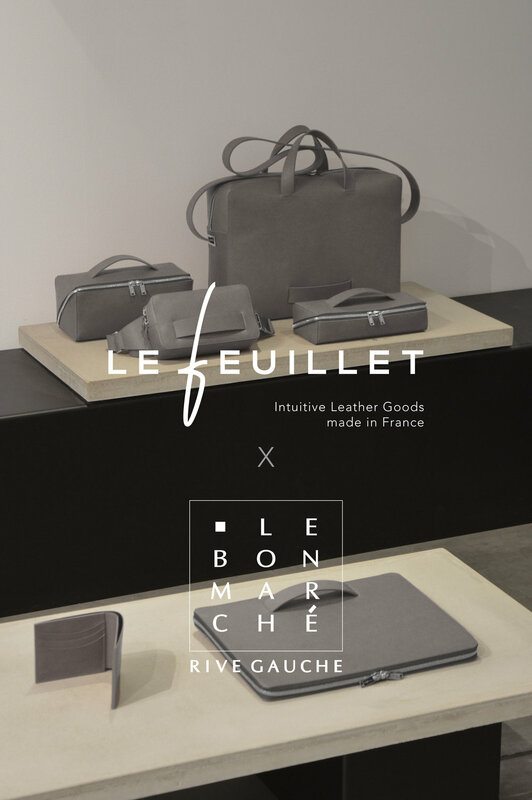 As part of the end-of-year festivities, Le Feuillet and Le Bon Marché have offer their guests an exceptional experience with the possibility of offering a unique, exclusive and personalized gift that participate in the magic of Christmas. Le Feuillet have propose to personalize products of its collection using its innovative "savoir-faire" in laser engraving during December 2016. 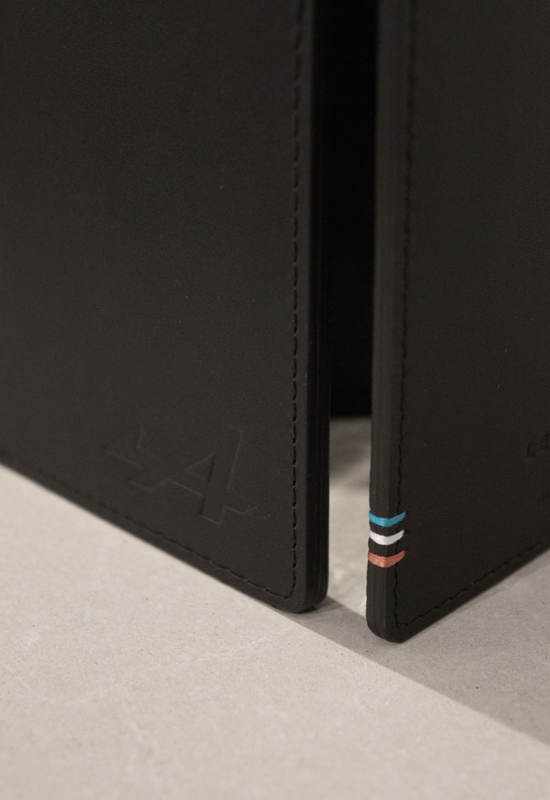 Ylan & Davy co-founders of the brand have been present to accompany customers in the choice of personalization and to carry out laser engraving. This summer we stopped at La Grande Motte to admire the city built by Jean Balladur just 50 years ago and take pictures of the most beautiful architectural french sea resort. 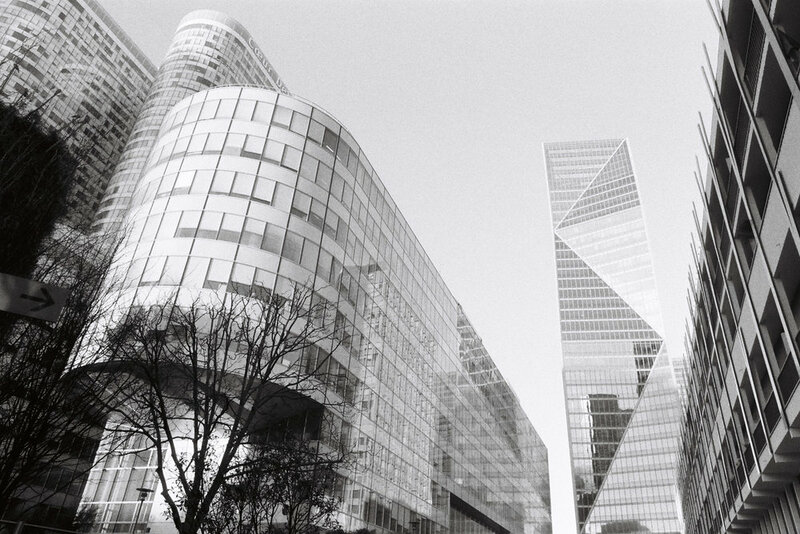 The architect Jean Balladur spent 30 years of its life to built on a blank page from A to Z an ideal city. They were only two, before him, in the XXth century, being able to meet this challenge: Oscar Niemeyer in Brasilia and Corbusier to Chandigarh. La Grande Motte is characterized by a big architectural homogeneity, the most visible elements are buildings in the shape of pyramid. Construction began in 1965 on a virgin ground. Jean Balladur drew his inspiration from pre-Columbian pyramids such as Teotihuacan, Mexico; and from modernist architecture in Brazil, especially the work of architect Oscar Niemeyer. Simon Porte Jacquemus, founder and designer of the eponym brand Jacquemus tribute to La Grande motte through his spring/summer 2014 collection. 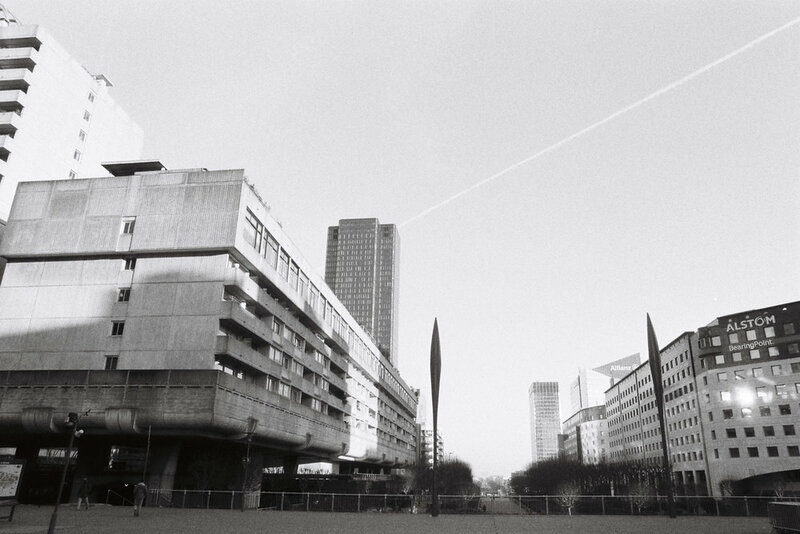 Today, Jean Balladur's work is studied by the schools of architecture of whole Europe. The specialist publications deal with this phenomenon. We produced a folio in collaboration with MAN for SS17 show. Making Of SS17 campaign with Hugo Comte. Thanks to Louise Porche & Yan Ndoumbé for this handsome day. Exposition "Osez la Pause" D'Days 2016 Joyce Galerie. 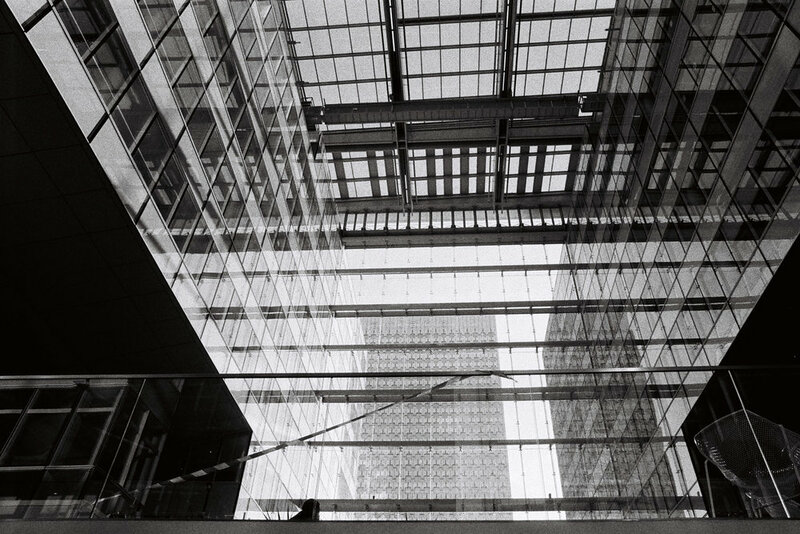 Lloyd’s Building by Richard Rogers built between 1978 and 1986. It was so great to receive the last issue of Monocle we are featured in at the London shop for our meeting today. Really nice release with all our friends from Lyon. Rehabilitation of Brasseries Belle-Vue by L’Escaut architectes et MSA. EYE Film Instituut Nederland by Delugan-Meissl. Voici le récap produit par www.accabl-studio.com et merci à nos partenaires Kapadokya, Peroni Nastro Azzurro & Dealer de Cook pour cette belle soirée. Recette exclusive Dealer de Cook pour Le Feuillet. Les deux chefs étaient présent sur l'événement de lancement de la nouvelle collection pour cuisiner en live cette collaboration inédite. La recette du Mak-Beef ici. 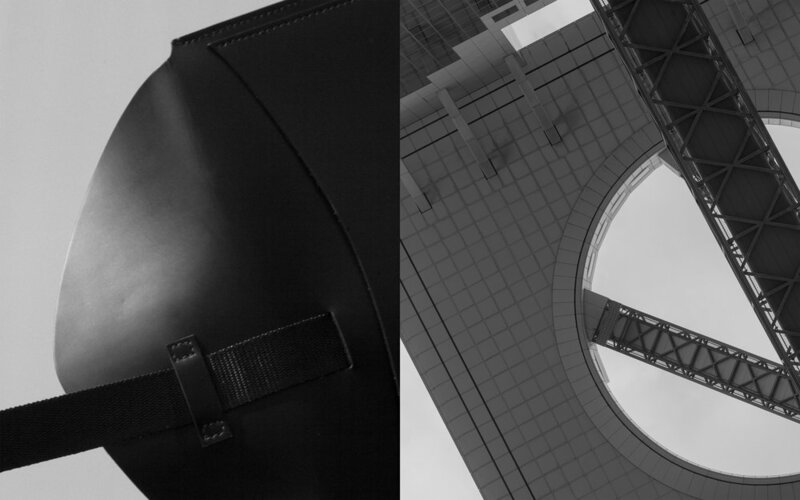 This video expresses the vision of the brand’s design putting in light the interaction between man and the object in our constant challenge to combine luxe with comfortable, functional with desirable and fashion with timeless. Some plans are inspired by the famous statue discobolus. 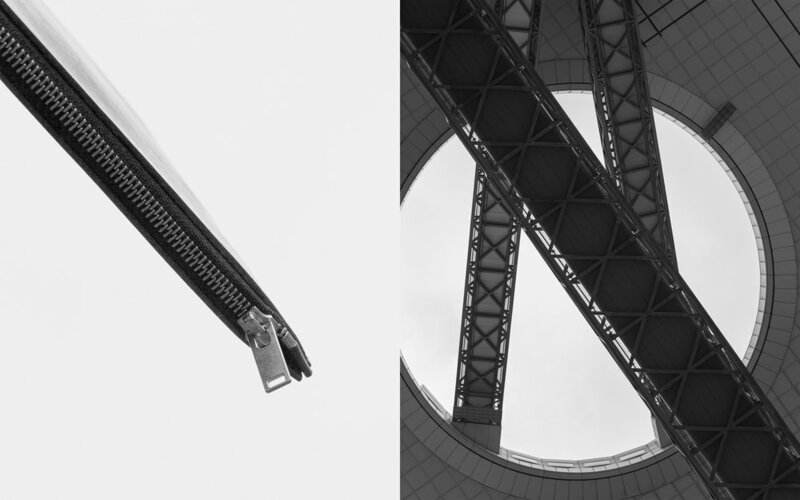 Shot by accabl_studio in the brand’s hometown of Lyon, the video incorporates the architecture of Musée des Confluences. Le Feuillet on Codryo Spring/Summer 2015 Editorial, shoot by Bleu Mode. Collaboration avec notre ami artiste Maxime Ivanez, qui vous présente sa vision de la marque à travers son pinceau et son encre de Chine. Le Feuillet présent sur le shooting de BUMPER FRANCE, une agence immobilière pas comme les autres. Plus d’images du shooting ici.